It’s official. I’m a Buffalo Bills blogger now. Three weeks of NFL games are in the books, and I am writing about the Bills for the third time. I never thought my life would turn out this way, but here we are. I thought after the first week when Nathan Peterman was terrible, and he was the guy that beat Josh Allen and the since traded AJ McCarron for the starting job that the Bills had the worst quarterback situation in the entire NFL. After that, I thought Vontae Davis‘ mid-game retirement was rock bottom, an illustration of the most miserable football franchise in the NFL. I was prepared to write off the Bills for the rest of the season, but then the most shocking result of the 2018 season happened in Week 3. 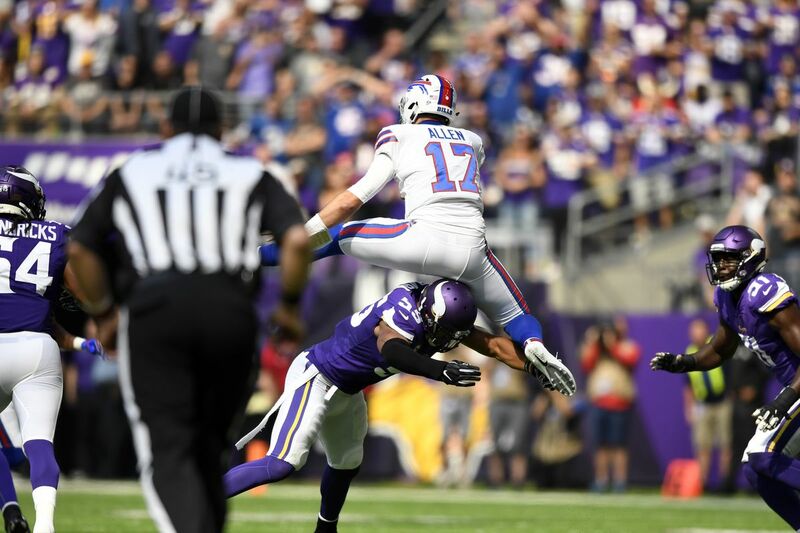 The Buffalo Bills went into Minnesota last Sunday and beat the Vikings 27-6 led by rookie Josh Allen. Allen went 15 for 22 passing with no interceptions, threw for two touchdowns, and ran one in himself from 10 yards out. In a year when five teams took quarterbacks in the first round of the draft and four of them will be starting this week, all no longer seems lost for the Bills. Allen looked pretty good, in a relatively low volume of pass attempts. The bigger questions from that game are with the Vikings, who were thought to be a Super Bowl contender going into the season. Minnesota made the NFC Championship Game last season with Case Keenum as their QB. Free agent Kirk Cousins was and is a clear upgrade over Keenum at the most important position in football, but the results have not been there so far. Since their Week 1 win over the San Francisco 49ers, the Vikes went on to tie the NFC North rival Green Bay Packers when their kicking game failed them, then lost at home to the Bills, and lost on the road to the Los Angeles Rams on Thursday night. The Rams game was going to be tough going in–the Rams may be the best team in the NFL–and there is plenty of time for Cousins and head coach Mike Zimmer to turn things around in a wide open NFC North, but 1-2-1 is not a good look for a team with Super Bowl aspirations. The Vikings have the QB they want, but the defense has not been as strong as it was last year. Right now, Cousins is playing well for a team that cannot get out of its own way, which is an all too familiar position for him. As for the Bills, they have the same record as the Patriots right now, and their quarterback is nearly half Tom Brady’s age. The “any given Sunday” cliche exists for a reason.